Saturday November 18th 1899 I hurried my work through this morning, got baking done and Will and I started to town a little after ten oclock. I went over home for dinner and he went over to Woolfs. It was chore time when we got home. Sunday November 19th 1899 We went to church early this morning and I called at Mrs Ogdens to take a last look at her for she is to be buried this afternoon. John and his son was there. Came directly home from church and after dinner read and wrote some. We spent the evening at Willie Andersons. It clouded up this evening Monday November 20th 1899 A dark cloudy day. I sewed on my calico dress Elmer Anderson and family spent the evening here It was fifteen years today since Charlie & Ida married. Tuesday November 21st 1899 I was busy sewing all day. it was just such weather as we had yesterday. I read in the evening. 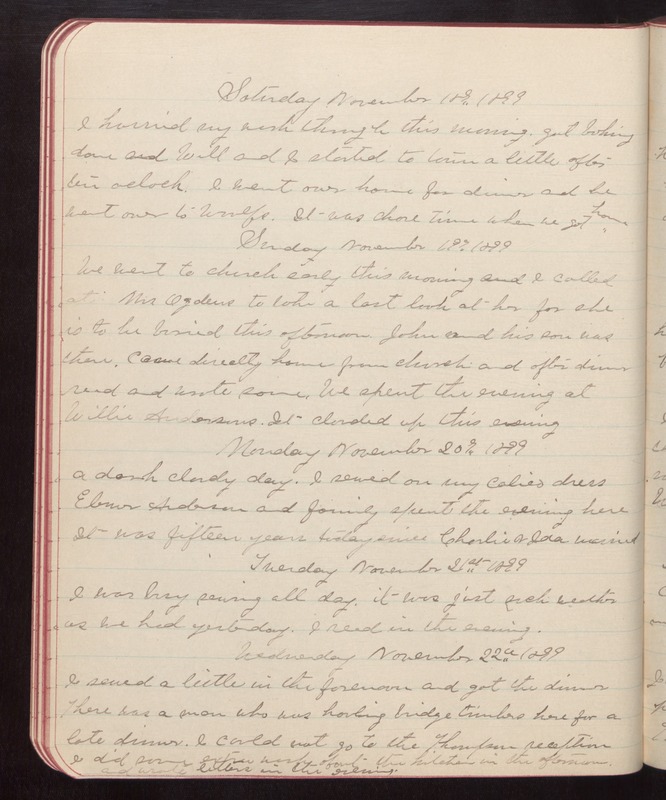 Wednesday November 22nd 1899 I sewed a little in the forenoon and got the dinner There was a man who was hauling bridge timbers here for a late dinner. I could not go to the Thompson reception I did some extra work about the kitchen in the afternoon. and wrote letters in the evening.